Abstract: A total of 26,368 eastern gray squirrels (Sciurus carolinensis) were examined for presence of Cuterebra sp. in Tennessee. During a 15-year period, Cuterebra sp. prevalence was 2.1%, which was lower than reported in other southern states. The highest prevalence of Cuterebra infestation was in eastern Tennessee (7.9%) and the lowest in western Tennessee (0.9%). Rodent bot or warble flies (Diptera: Cuterebridae) are common parasites of small mammals (Goddard 1986, Catts and Mullen 2002). Occasionally, they have been found infesting humans (Goddard 1997, Penner 1958). Cuterebra sp. larvae, primarily C. emasculator, are found on eastern gray squirrels (Sciurus carolinensis) from July through October (Jacobson et al. 1981). Squirrel hunters commonly notice bot fly larvae, also referred to as wolves or heel flies, on squirrels during fall hunting seasons and have been known to destroy squirrels they have harvested because they were thought to be unfit to eat (Atkeson and Givens 1951, Jacobson et al. 1979). During field enforcement activities Tennessee Wildlife Resources agency wildlife law enforcement officers routinely record the presence of bot fly larvae on gray squirrels harvested by hunters. However, individual numbers of larvae present on each squirrel are not recorded. This paper reports these observations for the years 1990–1999, and 2002–2006. Wildlife law enforcement officers counted numbers of gray squirrels having bot fly larvae during routine random checks of hunters during the fall squirrel hunting seasons of 1990–1999, and 2002–2006. Fall squirrel hunting season in Tennessee during this period was late August to 28 February (29 February in leap years) 1993–2006, and late August to 31 January 1990–1993. In contacting hunters, officers recorded the number of gray squirrels harvested and the number of squirrels with bot fly larvae or evidence of myiasis from bot fly larvae. During 15 years of collection, wildlife personnel examined 26,268 gray squirrels of which 551 (2.1%) had one or more bot fly larvae or lesions from botfly larvae. Of four TWRA administrative regions (Figure 1), the highest prevalence was in the East (7.9%) and the lowest in the West (0.9%) (Table 1). Highest statewide prevalence occurred in 2003 (6.35%) and the lowest was in 2005 (0.26) (Figure 2). Figure 1. Tennessee regions used in collecting Cuterebra sp. data from eastern gray squirrels. West: Includes the Coastal Plain and Mississippi River Floodplain, located west of the Tennessee River. Middle: Includes the Western and Eastern Highland Rims, and the Central Basin. Plateau: Includes the Cumberland Plateau. East: Includes the Ridge and Valley, The Blue Ridge and the Appalachian Mountain regions. Figure 2. Annual prevalence of Cuterebra sp. in Tennessee, 1990–1999, 2002–2006. Overall prevalence reported here is lower than published rates for gray squirrels. Jacobson et al. (1981) reported a prevalence rate of 19%, and in Alabama, Atkeson and Givens (1951) reported a high of 7.14%. In Virginia, Parker (1968) found a prevalence of 26.6% in a small sample of 15 gray squirrels. Pack (1972) reported 25% prevalence on opening day of hunting in September in West Virginia. In our study, the relatively low prevalence of bot flies in Tennessee gray squirrels indicates that there should be little concern for this parasite in our wild populations. The primary concern when there is high prevalence during hunting seasons is that hunters may discard infested squirrels (Jacobson et al. 1979). Table 1. Annual prevalence of Cuterebra sp. in Tennessee from samples of hunter-killed eastern gray squirrels. Cuterebra sp. does not affect gray squirrel populations. Castration has been attributed to Cuterebra sp. but there is no confirmation that this has ever occurred (Timm and Lee 1982). Larval sites on gray squirrels are primarily on the head just behind the ear, the side under the shoulders, the neck, and the back (Parker and Holliman 1971). Reported parasitism of infant gray squirrels could lead to mortality in some young (Slansky and Kenyon 2002) but it is unclear how often this occurs in the wild and whether there would be sufficient mortality to affect populations. Anemia and stress from bot fly myiasis could possibly result in a population reduction (Sealander 1961) but it is not known if this has ever occurred with gray squirrels. Atkeson, T. Z., L. Givens. 1951. Grey squirrel parasitism by heel larvae. J. Wildl. Manage. 15: 105-106. Catts, E. P., and G. Mullen. 2002. Myiasis (Muscoide, Oestridae). Pages 317-348 in G. Mullen and E. Durden, editors. Medical and veterinary entomology. New York, NY: Academic. Goddard, J. 1986. Ectoparasites of the eastern chipmunk, Tamias striatus, from Tishomingo County, Mississippi. J. Wildl. Dis. 22: 127-129. Goddard, J. 1997. Human infestation with rodent botfly larvae: a new route of entry? South. Med. J. 90: 254-255. Jacobson, H. A., D. C. Guynn, and E. J. Hackett. 1979. Impact of the botfly on squirrel hunting in Mississippi. Wildl. Soc. Bull. 7: 46-48. Jacobson, H. A., M. S. Hetrick, and D. C. Guynn. 1981. 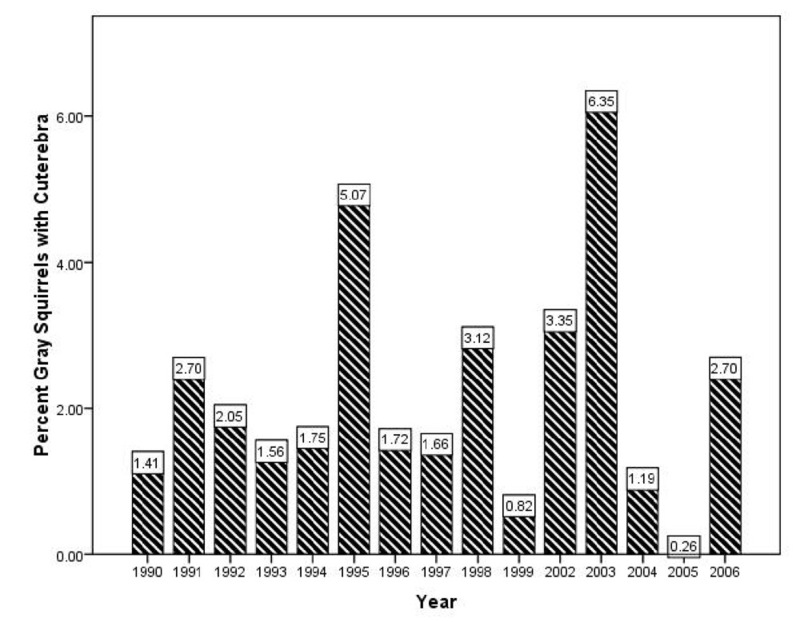 Prevalence of Cuterebra emasculator in squirrels in Mississippi. J. Wildl. Dis. 17: 79-87. Pack, J. C. 1972. Effects of a September squirrel hunting season. Federal Aid Progress Report W-39-R-13. Charleston, WV: West Virginia Department of Natural Resources. Parker, J. C. 1968. Parasites of the gray squirrel in Virginia. J. Parasit. 54: 633-634. Parker, J. C., and R. B. Holliman. 1971. Observations on parasites of gray squirrels during the 1968 emigration in North Carolina. J. Mammal. 52: 437-441. Penner, L. R. 1958. Concerning a rabbit cuterebrid, the larvae of which may penetrate Human skin. J. Kansas Entomol. Soc. 31: 67-71. Sealander, J. A. 1961. Hematological values in deer mice in relation to botfly infection. J. of Mammalogy 42: 57-60. Slansky, F., and L. R. Kenyon. 2002. Bot fly (Diptera: Cuterebridae) infestation of nest-bound infant eastern gray squirrels. Florida Entomol. 85: 369-371. Timm, R. M., and R. E. Lee, Jr. 1982. Is host castration an evolutionary strategy of bot flies? Evolution 36: 416-417.